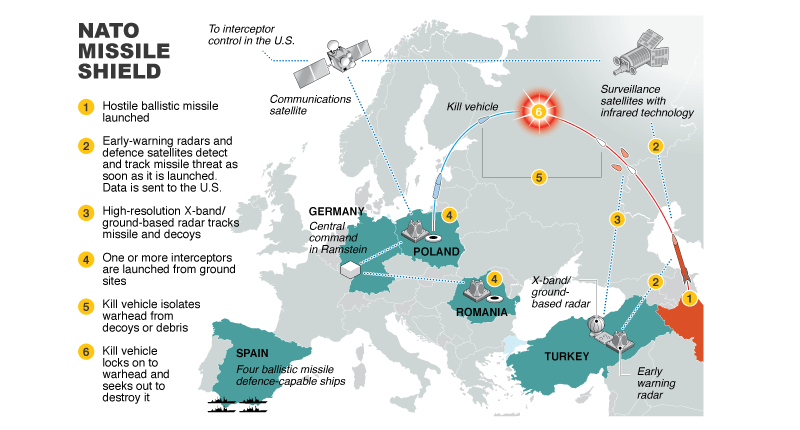 The European component of the US Missile Defence System is one of the major irritants in the US-Russian relations. The American administration insists it is aimed to counter threats coming from Iran and North Korea. The Russians respond that geography, laws of physics and irrefutable facts clearly indicate that the system is targeting Russia, not Iran. Almost a decade after Washington proposed deploying a base in Europe, American and NATO officials are slated to declare operational the so-called shield by activating a web of missile systems it has deployed across Europe over the years at a remote air base in Deveselu, Romania on Thrusday which has started a New Cold War of sorts. The first element of this revised system, an early warning radar station in Malatya, Turkey, went operational on 16 January 2012. Other parts of the missile defence system are planned to be built in Portugal, Poland, Romania and Spain. The alliance says the shield will come into full operation by around 2020. However, Russia demanded legally-binding, written guarantees that the project would not undermine Russian national security, harm the strategic nuclear parity with U.S. and may target its nuclear forces. Kremlin says that deployment of U.S. interceptor missiles and radars in Europe is a potential threat to the Russian nuclear arsenal, while Washington is trying to convince Moscow that the European missile shield poses no threat to Russia. Russia on its part does not rule out delivering pre-emptive strikes against missile defence objects in Poland and Romania and shooting down U.S. satellites utilized as part of the shield. “The placement of new strike weapons in the south and northwest of Russia against [NATO] missile defence components, including the deployment of “Iskander” missile systems in Kaliningrad region is one possible way of incapacitating the European missile defence infrastructure,” Chief of the General Staff Nikolai Makarov said. At the same time Russia is testing unstoppable new nuclear missile which can breach NATO’s shield system and blow up an area the size of France. The RS-28 Sarmat missile, dubbed Satan 2 by NATO, has a top speed of seven kilometres (4.3 miles) per second and has been designed to outfox anti-missile shield systems. The Kremlin’s new intercontinental ballistic missile will be ready for field trials this summer, according to the Russian news network Zvezda, which is owned by Russia’s ministry of defence. Additionally, Russia is also developing a new hypersonic attack aircraft Yu-71 that can carry nuclear warheads and penetrate missile defence systems under a secret missile program codenamed “Project 4202” according to a report by Jane’s Information Group. Just as US is about to inaugurate a first-of-its-kind ground-based missile interceptor site, part of a larger shield, Iran’s defence ministry has announced the delivery of a powerful S-300 air-defence missile system from Russia. Surprisingly at the same time a senior official within the Indian Ministry of Defence told Defence News that there will be delay in the procurement of Russian S-400 Missile Defence System due to a budget crunch. Contrary to the defence minister’s claim in parliament Tuesday that the Indian Air Force will acquire five firing units of the S-400 long-range surface-to-air missile (LRSAM) system between 2017 and 2022, one senior Ministry of Defence (MoD) official who requested anonymity says a budget crunch will prevent such a purchase for at least two years. “Our priority is to clear the global buy of $8.9 billion for Rafale fighters, $1.5 billion for very short range air defence (VSHORAD) man-portable systems and $1.5 billion in short-range surface-to-air missile (SRSAM) systems. There is no money for other foreign purchases,” the official said. However, the Defence Acquisition Council (DAC), the highest body under the Ministry of Defence (MoD) which decides weapons purchases, had already cleared the purchase of five units of Russian-made S-400 Triumf (AD) advanced Air Defence Systems [with Indian specifications] at a cost of about $4.5 billion at its meeting in December 17. Since Defence News did not identify the senior Ministry of Defence (MoD) official who made these counter claims the reliability of this information is still disputed. Also the way in which the news came out and the timing is also questioned by many experts. Nonetheless, this news was immediately picked up by The Diplomat and the news now serves in dragging India into this controversy. At the same time plans are afloat to get India on par with NATO allies as well. A Congressional resolution aiming to bring India on par with America’s NATO allies has been introduced in the Senate by Senators Mark Warner and John Cornyn – co-chairs of the Senate India Caucus ahead of Indian PM’s expected visit to Washington next month. A similar Congressional resolution was also introduced ahead of Defense Secretary Ashton Carter’s visit to India in March. What many Indians may not know is that just as Europe is used as a base to threaten Russia now, India was also used by the Anglo American lobby as a strategic base to safeguard their interests. In each and every subsequent appreciation of the British chiefs of staff from then on till India’s independence that is available for examination, the emphasis was on the need to retain the British military connection with the subcontinent, irrespective of the political and constitutional changes there. Equally, they stressed the special importance of the Northwest of India in this context. (Top secret document, PHP (45) 15 (0) final, 19 May 1945, L/W/S/1/983988 (Oriental and Indian Collection, British Library, London). The achievement of these objectives was collectively called as the Great Game. 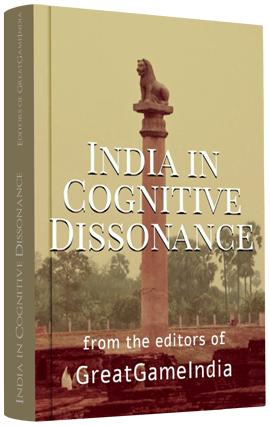 To achieve the total control of India, the British used the Divide and Rule policy in terms of religion, clan, tribe, caste, region and language; the effects of which we are still felling as a continuous descent into mental, emotional and psychological slavery from which Indians were never able to come out. This is exactly what is playing out in Europe and the Levant War Zone today. This same strategy continues till today disguised under various names and terms – the New Great Game, Cold War, New Cold War etc.